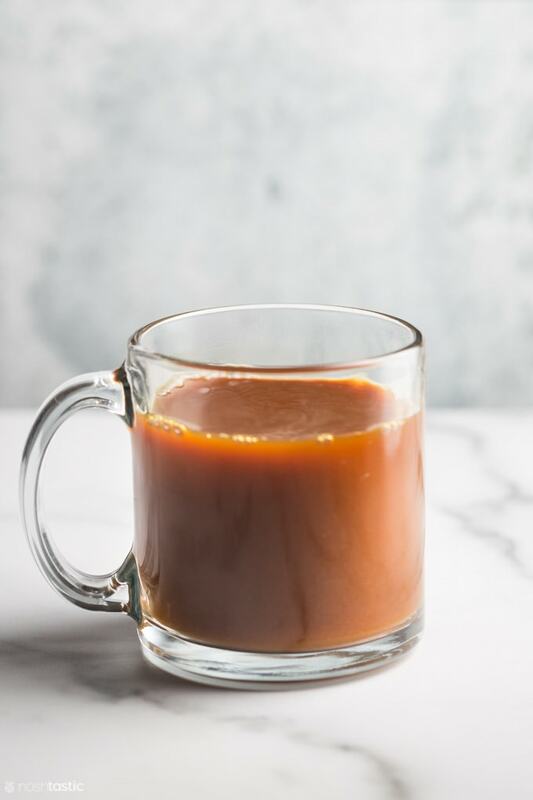 Turmeric Tea is packed with healthy immune boosting antioxidants  thanks to the copious amounts of turmeric I’ve packed into this warming drink! 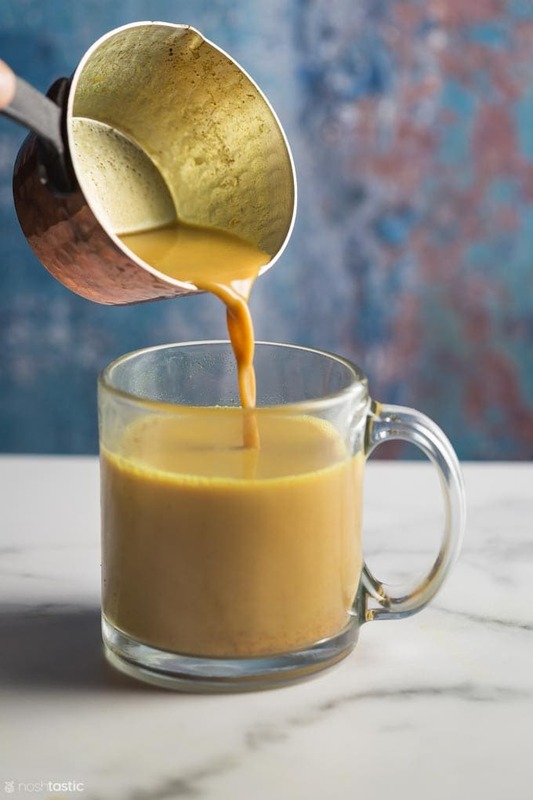 Also known as Golden Milk, Turmeric tea really couldn’t be simpler to make and you can make it dairy free as I have done here, or you can use regular milk, or you can drink it ‘black’ and just make it with hot water and no milk at all. They all work, all taste great, so let me show you how I make it! 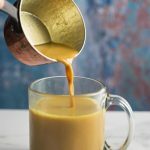 This is such an easy recipe and there are a few options for making your own turmeric tea depending on how you like it. First, I’m assuming that you will be using ground turmeric as that is the most common and readily available in every grocery store. I usually make one cup of tea at a time, so this recipe reflects that. Start by adding one mug of water to a pan on the stove. Then simply add the turmeric, fresh ginger, cinnamon, and ground black pepper and let it simmer for about ten minutes. Remove the ginger before serving, if you want to add a little milk you can do that, any sweetener you prefer can be added to taste. What’s the deal with black pepper and turmeric? It might seem like a curious combination, turmeric and black pepper, especially in a cup of tea! But ground black pepper is known to help the absorption of curcumin, which is the main active compound in turmeric. Black pepper has its own active compound, piperine, and it’s this nifty compound that helps to boost the levels of curcumin your body can absorb. 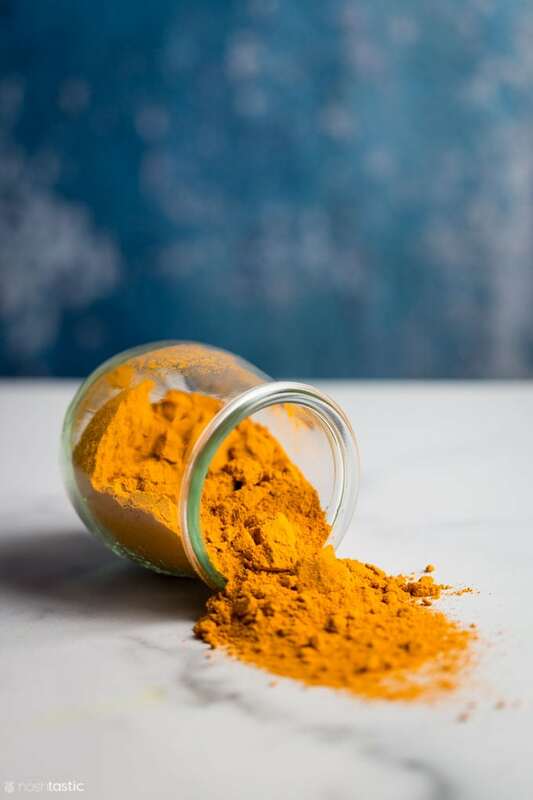 Turmeric is ground spice that comes from the root of the Curcuma longa plant and is part of the ginger family and also has a tuberous root or rhizome that looks similar to ginger. It’s native to India and that’s where most of the commercially grown turmeric you’ll find in your grocery store comes from, but is also found and grown all over South East Asia. It’s a very versatile spice and we love to use it in Curries such as Keto Butter Chicken, Chicken Korma, and Chicken Tikka Masala. More Quick Facts on Turmeric! Want More Gluten Free Recipes like this? Subscribe to my newsletter! Simmer water with the ground turmeric, fresh ginger, cinnamon, and black pepper. After ten minutes remove the slice of ginger. Add a little milk of choice if desired, and sweetener (I like mine unsweetened) serve immediately. TIP: You can make double or triple the amount of turmeric tea and keep the remaining tea in the fridge and reheat it as needed over the next few days. Nutrition Facts - the nutrition label does not include milk or sweeteners of any kind. Storage - Turmeric Tea will keep in the fridge for several days, you can microwave to reheat, or reheat it on the stove. Milk - you don't have to add milk, but it definitely makes it creamier and more palatable I think. I especially liked adding coconut milk to this recipe.